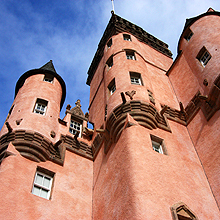 Scotland’s castles and country houses developed over time; they are part of the same lineage. The 12th century Motte-and-Bailey made way for the famous Tower House from the 14th century; the Laird’s House slowly emerged during the 17th century along with Classical architecture and culminated in grand Georgian mansions from the 18th century and Victorian embellishment in the 19th century. The architectural development of these iconic buildings reflects Scotland’s increasing political stability and economic prosperity, ensuring the progression from defensive castles to prestigious mansions. LTM’s respected masonry teams, supported by our in-house Stone Conservators and Traditional Plasterers have extensive experience in conserving these landmark buildings. Understanding the historic fabric is crucial to achieving best conservation practice, focusing on the integrity of the building and maximising material performance. Whether a private home or scheduled monument, LTM have been involved in a number of significant castles and country houses. LTM Consultancy can also provide professional, technical advice on building defects and problems, as well as undertaking maintenance inspections and detailed stone and plasterwork condition surveys. We can provide bespoke surveys to address the needs of the building and the concerns of the client, providing cost-effective repair strategies to ensure the continued use of the building through informed repair and conservation interventions. "I was so impressed by the work you and your masons have done on Craigievar and I know that my parents would be have been both grateful and thrilled by your work, so thank you from us all, alive and dead! It was a great occasion on friday and lovely to see our home so well cared for by your team. I have never seen the castle looking better, the way the underlying form was so crisp and clear was exciting to see. Daphne Rose gave me your details and I looked at your web page, you are a wonderful artist, your men also so many congratulations from us all to you and your team."